The Bookmark Project is back! Actually, it has been going on behind the scenes all this while, and after a lull, I found a gem in the bookmarks yet again. As a child, I loved to play pretend games of House-House and School-School (I played a pretty convincing knuckle-rapping schoolteacher and managed to frighten some of the younger neighborhood kids). Now that I get to play House-House on a daily basis whether I want to or not, so I occasionally play Restaurant-Restaurant instead. And the best part of a restaurant meal is a platter of tempting appetizers. 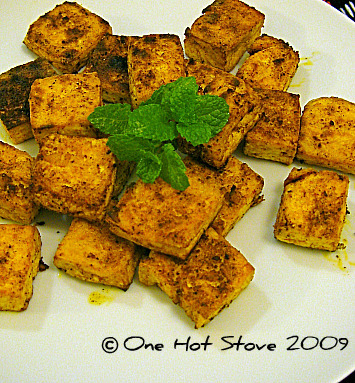 I bookmarked Madhuram's Baked Tofu- Indian Style based on her superbly tempting picture alone. It is adapted from a recipe by the Indian cookbook author Mallika Badrinath. I have several of her booklets and should revisit them sometime. In any case, I was pretty skeptical of the recipe. It sure looked like tandoori tofu, but where is the ginger-garlic paste? Where is the yogurt for the marinade? Would this 5-ingredient recipe really work? Well, sometimes, if you set aside your preconceived notions and give something a try, you are handsomely rewarded as I was. The method is as simple as whisking together a marinade made from a handful of pantry ingredients, marinating the tofu for an hour or so, then baking/broiling it to crispy perfection. The liberal use of lemon in the marinade is very important- it soaks into the tofu, and in baking forms a tangy crust that is completely irresistible. I used spices liberally too, to make up for the bland tofu. 1. Use a block of firm or extra-firm tofu, drain out the water and press it under something heavy for 30-60 minutes to drain out as much water as possible. 3. Cut the tofu into bite size pieces and add to the marinade. Gently spoon the marinade over the tofu to cover all the pieces. Cover and refrigerate for 1-2 hours. 4. Preheat oven to 450 F. Grease a sheet pan, then lay the marinated tofu on the pan in a single layer. Spoon any remaining marinade over the tofu. 5. Bake for 25 minutes or so, then turn on the broiler, transfer the pan to the broiler and broil for 10 minutes or so (watch it like a hawk!) or until the tofu has a golden crust. Serve right away. In another restaurant-inspired move, I made an onion relish for the tofu. I like using paprika for both its bright color and taste. This delicious appetizer is completely vegan and I will be making it again and again. It takes barely 5 minutes of active time, the marinade and the oven take care of the rest. Thank you, Madhuram! AIf only I had the sense to write this post, what, a month ago, it would have fit the half-dozen strict stipulations of Anita's Express Indian event. This is a party dish if ever there was one. But do go over and read the inspiring round-up of quick Indian recipes that are good enough to show off to company. Nice and quick! I posted the same in my blog...but a little different version. Oh...love white vinegar..use to clean my veggies to wash away pesticides and dirt...and to clean my cutting board too. OMG..Yum! Yum! I am going to definitely try this sometime.A thai restaurant near our place serves very tasty fried tofu-this seems like an infinitely healthier substitute. Oh and I wanted to tell you- I made those cashew larabars yesterday, that I told you about. It was sort of inspired by the link I posted in my comment. Sooo simple- just cashews and dates(as binding). I am going to try it with mixed nuts and maybe oats? Me likey! The picture is indeed super tempting and i love the pairing with onion relish! This is nice! I would love to make it! Thank you so much for trying the recipe Nupur. I'm so glad that you liked it. Hey sweetie, I have not visited in a while... hoping you are well. Yummy.I usually make the tandoori with Chicken and Paneer. Tofu is next on my to try list. Tandoori tofu is the only way my hubby eats Tofu! But I cheat & just use the store bought tandoori paste & do a quick stir fry on the skillet. Looks delicious. Preeti Kashyap- Yes, white vinegar has a thousand household uses! Mahek- I hope you enjoy the tofu. Lavanya- I'm inspired by your comment- next time, I might use Thai curry paste instead of garam masala and serve the broiled tofu with a satay sauce instead! The energy bars sound fantastic- I'll be making them soon too. Musical-They taste wonderful, you gotta try this one! Madhuram- Thanks for sharing the recipe- it is a keeper! Prathibha- Yes, this is quite nutritious as appetizers go. 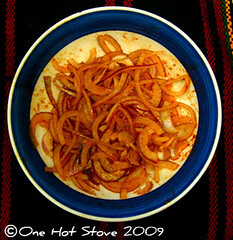 Kanchan-Yes, onion relish sure is tasty. Sheetal & Rahul- Definitely worth a try! Hmmm, maybe the next best thing to having a tandoor oven in your kitchen?! Ooh- your Thai variation sounds delicious tho' right now I am more in the mood for your Tandoori-style one. A very happy Deepavali to you, your family and readers! Just stopped by to wish you a very happy and prosperous Diwali. I made this yesterday for a Diwali dinner party and it was an absolute hit! I used Soma's recipe I think! Oh wow.....the tofu looks fabulous! I think its a good start for tofu skeptics like me :) Hope you had a good Diwali! Simple yet looks delicious! !I can't wait to try this! How did I miss this post not sure. I love that tandoori style tofu and I dont think I have tasted that relish but will try for sure. This was delicious! Even my tofu disliking 9 year old gobbled it up. Thanks for a great recipe! Hey,made this today. Absolute delish......! Thanks . I was checking out this recipe from pinterest but I wasn't sure on the tumeric ingredient? The list reads ... &frac 12 tsp. turmeric powder? Is this supposed to be 1/2 tsp tumeric? Yes, it should read 1/2 tsp.